I'm going to use JAZZ A-W6WFDW monochrome display in my project which is using ST7567 Controller. 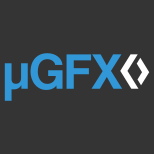 Can I use ugfx or its limited to some of the controllers outside only? There's a list of all supported controllers on the website/homepage. You can also have a look at the /drivers directory. And as @inmarket said: Adding a new driver is very easy. There's documentation and plenty of existing samples including drivers for very similar display controllers.